As non drivers, for us packing for any trip away always has to be quite a considered activity, especially now I'm pregnant, with all the back pains I'm having, anything that isn't necessary really needs to stay at home. 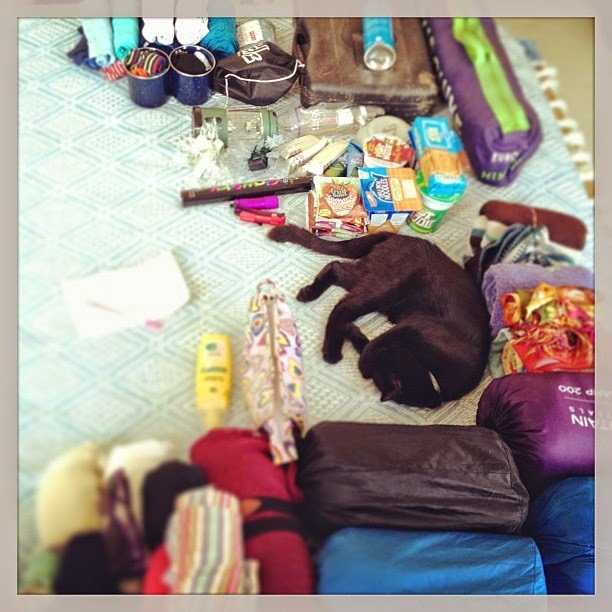 We've not been to Camp Bestival before but we did attend Latitude last summer and Milo and I headed down there on our own, so I feel I have a little experience of the light packing required. Tent (we had a 2 man last year, which was fine for me and Milo and even OK for the 3 of us when Johnny decided to turn up and surprise us) but this year I think we're borrowing my sisters 4 man, to give us a little more space as Milo and myself are both a little bigger than last year! Sleeping Mats. We borrowed some self inflating ones off a friend last year that were fab, similar to this one, they were comfy easy to carry and set up and something we'll be purchasing for ourselves this year. Pillows. Last year I simply took our slimmest regular pillows and rolled them up. They weren't too heavy and meant we had a little bit of extra comfort. I then used my hoodie for a bit of extra support under this, which worked really well. Light Weight Fleece Blanket. Light enough and small enough to carry, but provides a little extra comfort. Small Camping Stove. We have one like this, which is nice and small but enough for our morning cup of coffee requirements. Battery Powered Fairy Lights. These just make the tent that little bit more cosy, totally not necessary but small enough to make it in the bag. I was really happy with the food stuffs we took with us last year. They provided enough to get us through the morning before the arena opened, we took snacks on site with us and were also able to feed ourselves a couple of lunches, meaning we weren't completely reliant on purchasing food there. Bread. Last year I made a small loaf the day before to take along, we also took a small jar of jam. As we didn't break into the bread until the first morning, it stayed reasonably fresh and provided us with breakfast 2 days. Apples. The easiest fruit to take in my opinion, easy to store and transport without any worries of squashing or going bad in the heat. Coffee/Tea/Sugar. I don't use milk in my coffee so didn't consider what to do about that last year, as the Mr does have milk in his tea I'm not sure yet how will deal with this. Dried Fruit. Raisin boxes and the little bags of yoghurt covered fruits worked great for us last year, so expect we'll do the same this year. Biscuits. Also something you don't need to worry about going bad in the heat. Shampoo/Shower Gel. I decant some into a little travel bottle. Books, the smallest, lightest ones we can find in our collections! Pencil case with a collection of pencils for the boy to colour. A small knitting project for myself. Ear Plugs. Didn't have these last time and they were the only thing I really thought we were missing. Clothes too of course! We'll also have a fancy dress outfit for Milo for Saturday's Circus theme and I'll be keeping an eye on the weather as it approaches to make sure we have the right equipment for defending the elements. But that's our big list. I was so surprised last year at how much I managed to fit into such a small space. I took just one large camping rucksack and one large shopping bag, giving one had free all the time for Milo when changing trains etc. I really am getting so excited now! If you have any top tips for festival camping with children I'd love to hear them.